Jodhpur, India submitted to ‘Pop of Color’ on National Geographic. Kristian Bertel has contributed to the National Geographic Your Shot community with an assignment called ‘Pop of Color‘. This assignment curated by Kristen McNicholas, an associate photo editor at Nat Geo Your Shot wants us to actively look for color and think how it can be effective in a photograph. We should experiment, explore and use color to tell us a story about the place we are photographing. Color is all around us, but how much do we notice? In Europe suburban neighborhoods, you rarely see a bright purple house. But in India, for instance, color is everywhere. As Kristen is saying it: ”- Fill your frame with nothing but color. Find a single color surrounded by neutrals. Play with multiple colors in a frame. Make portraits incorporating color and be searching for the color in your everyday life that you may otherwise overlook. Color really is everywhere — you just might be surprised at what you see when you start looking a little harder!”, she says. Spring colors are clear and bright, just like the colors of a spring day. The sun is low on the horizon, so everything is imbued with the golden hues of the sun. The trees and grass have not yet matured, so they are tinged with yellow undertones and are a bright spring green color. Distinct yellow undertones impart a vibrant, electric appearance to everything. The colors of this season are truly like a spring bouquet of flowers enveloped in bright spring green leafy foliage with red-orange and coral tulips, bright yellow jonquils and daffodils. Summer colors of this season are muted with blue undertones think of looking at the scenery through a dusky summer haze. Late summer blossoms, a frothy ocean and white beaches are seen everywhere. Baby blue, slate blue, periwinkle, powder pink, seafoam green and slate grey are typical summer colors. Autumn colors are virtually indistinguishable from the rich, earthy colors of the season for which they were named. They are as golden-hued as a fall day, and it is impossible to mistake them for any other season. Typical colors from the palette include pumpkin, mustard yellow, burnt orange, brown, camel, beige, avocado green, rust and teal. Autumn colors are perennially popular, because they bring a feeling of warmth. Winter colors from this season are clear and icy, like a winter’s day always with subtle blue undertones. To name a few, hollyberry red, emerald and evergreen, royal blue, magenta and violet. Winter inspires pictures of winter berries, pine green conifers and black and white huskies racing through snow. As seen in the photograph above Jodhpur is a popular tourist destination, featuring many palaces, forts and temples, set in the stark landscape of the Thar Desert. 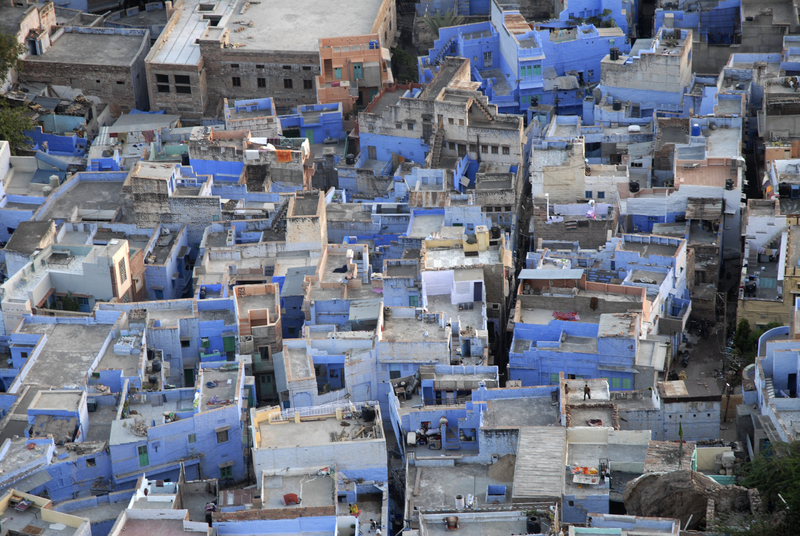 Jodhpur is also widely known as “Blue City” for the blue color on the houses in the old city area.There are no historical mentions providing reason why the color is blue. There are many reasons as defined by the ancestors and tour guides. Many of the houses in Jodhpur’s older neighborhoods are colored in striking blue, a sharp contrast from the neighboring Thar Desert. ”- Varieties of the color blue may differ in hue, chroma also called saturation, intensity, or colorfulness or lightness or value, tone or brightness or in two or three of these qualities. Variations in value are also called tints and shades, a tint being a blue or other hue mixed with white, a shade being mixed with black. A large selection of these various colors is shown in the submitted photograph above. Though there are no historical mentions to the reason why the color is blue and there are many reasons as defined by the ancestors and tour guides”, the photographer Kristian Bertel says.